There are far too many deer in Southold Town, something dramatic has to be done to reduce their numbers, and many residents are tired of talking about the problem and attending meetings where the issue is discussed. On Wednesday, Southold Town will host an important forum on the problems posed by the far too large deer population that is thriving and rapidly growing on the North Fork. 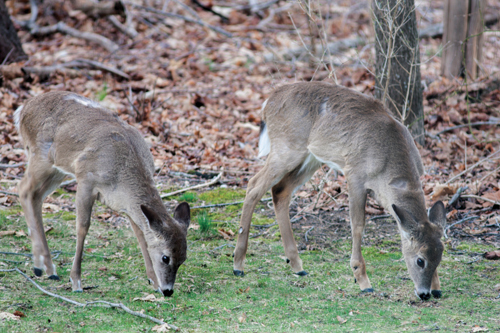 Southold Town will host a forum on deer management Wednesday, Sept. 12. The meeting, scheduled for 6:30 p.m. at Town Hall, will address the excessive deer population on the North Fork. To get an estimate of just how many deer there are roaming from Laurel to Orient Point, Southold Town’s department of public works will be conducting a deer census next month and is calling on volunteers to pitch in. Southold Town will advertise again for a wildlife management position that has not been filled since the Town Board first backed its creation in August 2015. Since September, the five volunteer members of Southold Town’s tick management committee have been independently researching the growing problem posed by tick-borne illnesses.